Here you can customize the texts of EurekaLog so you can use EurekaLog in your favorite language, or just to show a customized text. 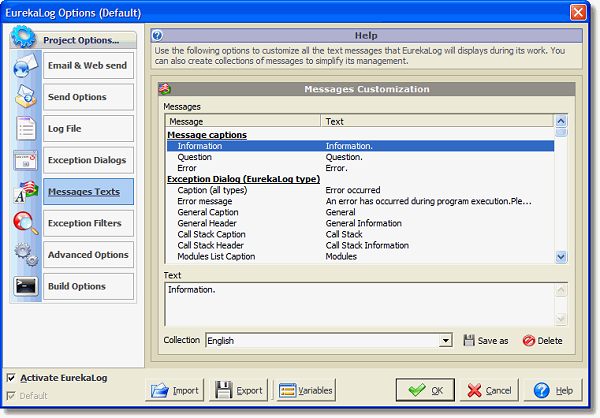 First select a message in the "Messages" window and then customize it in the "Text" box underneath. You can save every your "Messages Text Collection" using the "Save as" button. You can delete a "Messages Text Collection" using the "Delete" button. You can load a saved "Message Text Collection" simply selecting it from the drop-down list. Using the previous options you can also create and save more different EurekaLog translations.